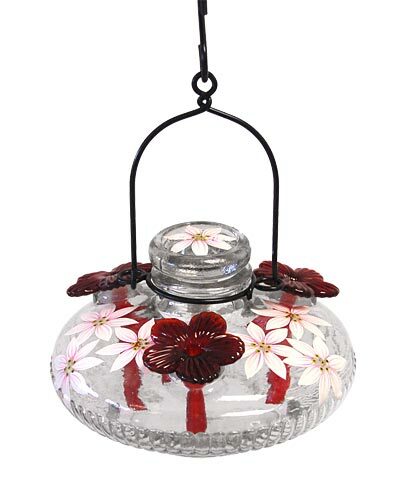 Enhance the floral motif in your bird sanctuary using this Parasol Clear Bloom Botanica Hummingbird Feeder. Offering nectar in this blown glass reservoir elegantly invites hummingbirds to your yard, while hand painted flowers on it lend an artistic effect. The circular body creates a striking feeder, while vertical, impressed lines on the bottom half of the piece add texture. The clear vessel holds 16 ounces of nectar easily, and three ports with red feeding flowers allow hummingbirds to reach their treat. These flower shapes perfectly enhance those painted onto the feeder body, highlighting your love of the natural world. The decanter style top removes easily for filling the unit, and an attached, 4" long, metal hanger makes it simple to place the feeder. An included, 2.25" long "S" hook offers even more hanging options, and the flat base of the feeder rests on a level surface. Its clear hue keeps nectar levels visible, and the glass construction remains easy to clean and maintain. Add lasting blooms to your bird garden with this Clear Bloom Botanica Hummingbird Feeder.